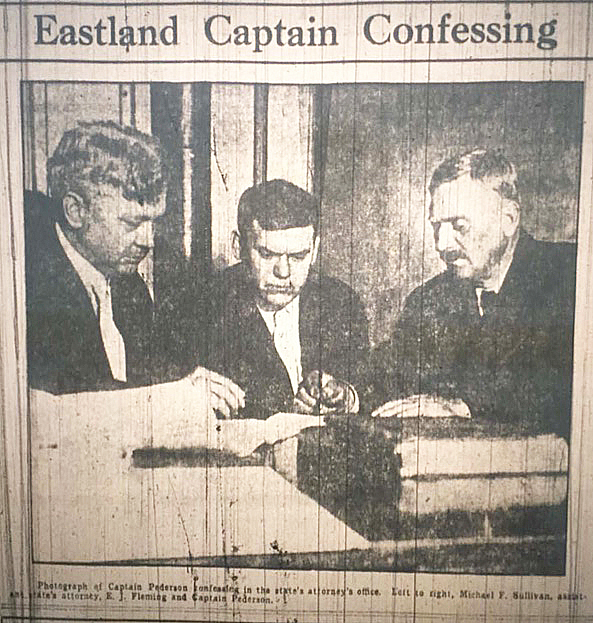 In the wake of the Eastland disaster, a hundred years ago this week, lots of fingers were pointed, though nothing ever really came of the hearings and investigations. No one was ever really held responsible, though making the guilty pay was a major theme from editorial cartoons of the day. Here are some examples from the days following the tragedy, part of our week of posts on the subject. 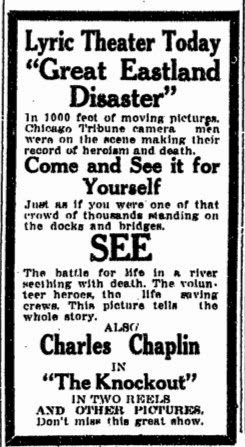 often showed footage on the bill with Chaplin films. 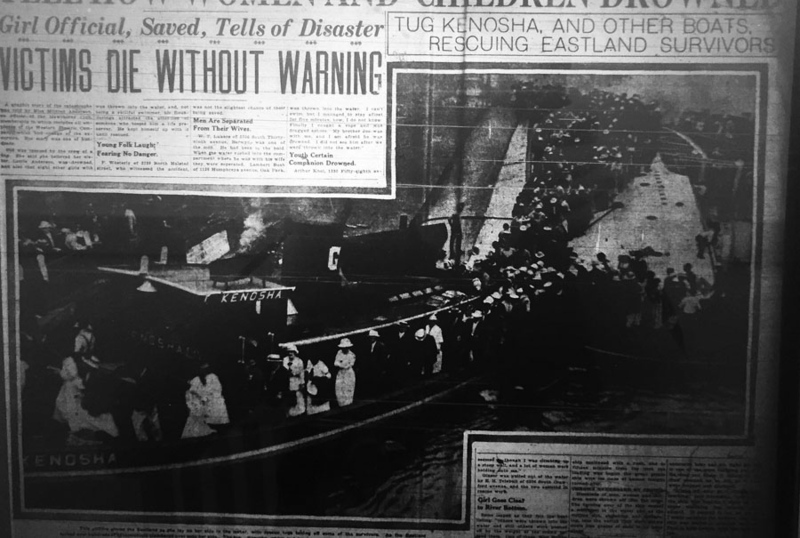 More Eastland Disaster footage has been found in a Pathe newsreel digitized by a British firm. 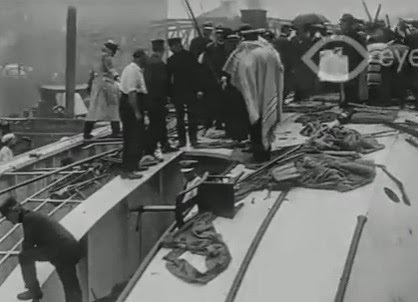 This is far more graphic than the previous footage, showing a body being removed from the hull of the capsized ship. Again, tracing it back to the known footage is tricky. 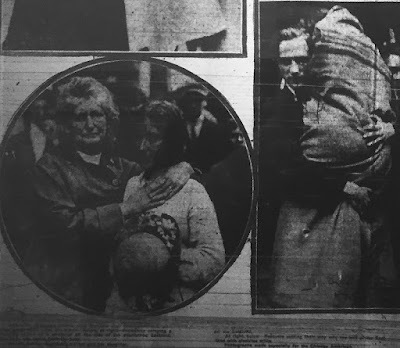 Did Pathe have a cameraman on the scene, or did they buy footage from one of the others who were known to be there? Robert Loerzel published several cards from the old film censorship board rejecting Eastland films, and Pathe isn’t one of them. Then again, they clearly didn’t consider every version known. 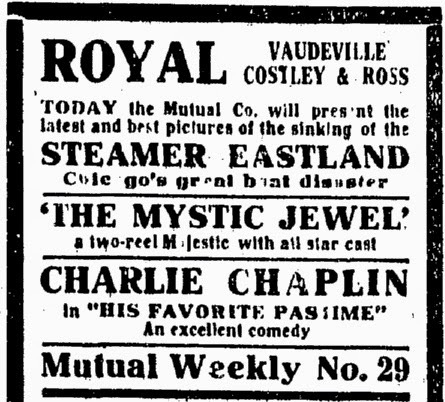 Mutual, for instance, had an Eastland film that wasn’t shown to the censors. So did Paramount Travel Films. 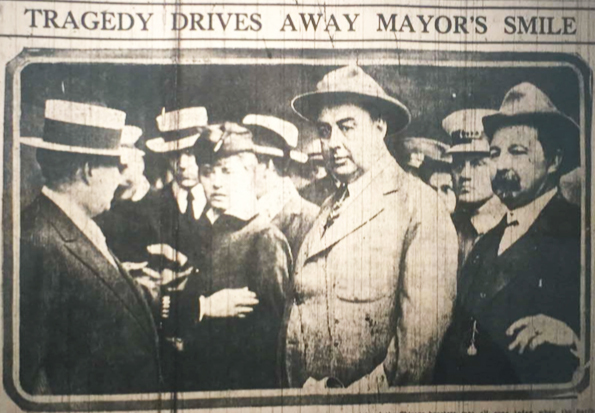 And there’s an ad or two out there for theatrical showings of films of the funerals. But did these companies all make films of their own, or just license footage made by others? 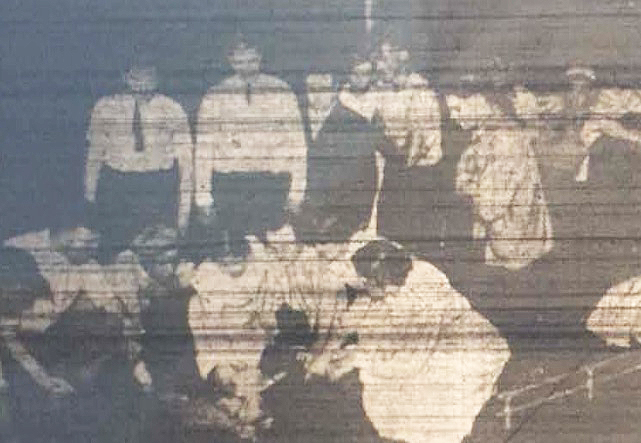 The most common version of the film footage was the one made by the Tribune cameramen, who got about 15 minutes worth of footage that was then exhibited. 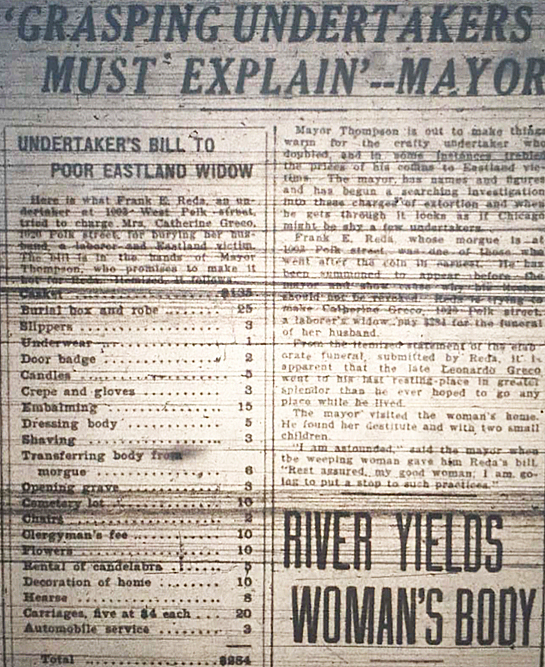 However, descriptions of it often made a point of saying that nothing particularly “grewsome” (sic) was shown. 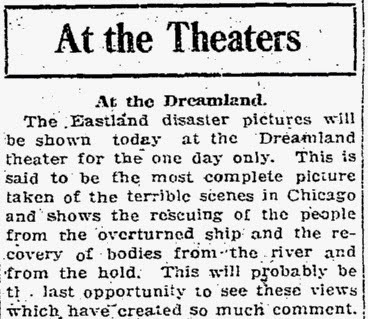 Then again, some descriptions of the Tribune film do mention bodies being loaded onto wagons, so it’s worth considering that maybe they just had a different idea of what was gruesome (besides a different spelling of the word) at the time. 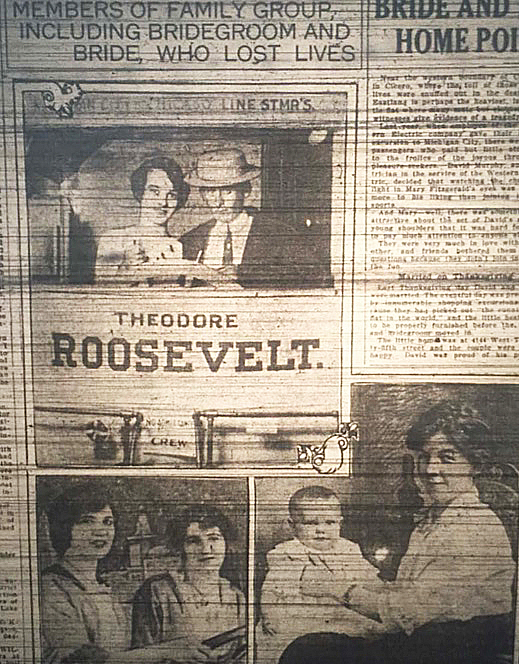 There are a couple of references in the paper archives – mostly from later on in the saga – mentioning films that do seem to line up exactly with this footage. 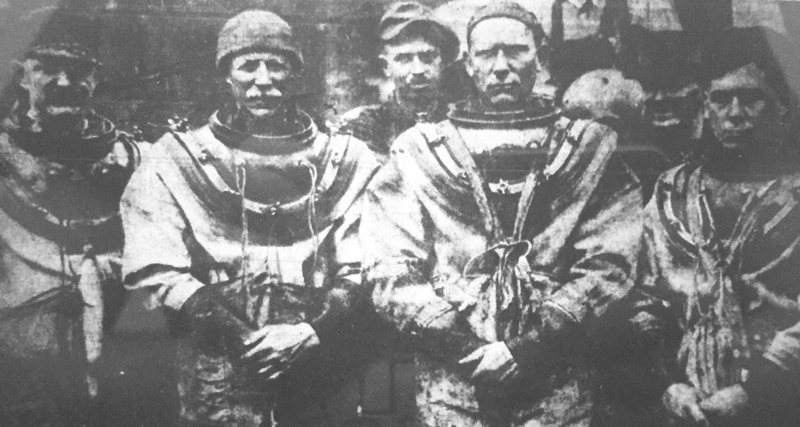 A few versions of the film were known to be shown in early August (not quite two weeks after the disaster, but already very late in the era when films were shown) refer to the “most complete version” including scenes of the bodies. In no case, though, does either the article or the theatrical ad indicate which version it is, or how it compares to others. like the one in the Pathe reel. 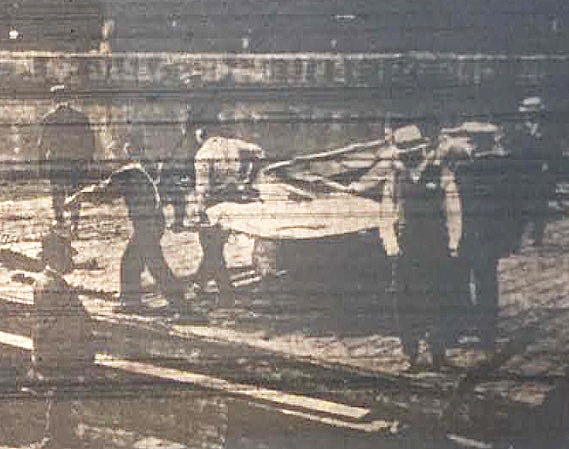 One that was shown at the Dreamland Theatre in Rockford, IL on August 4th spoke of bodies being removed from the hull of the ship, exactly as depicted here. However, neither the brief article nor the ad for the theatre itself specifies which version they’re actually showing, only that it’s the “most complete” version, which would generally connect it to the Tribune version. In all the descriptions of that film, though, it’s said that the dead are only shown covered by blankets. 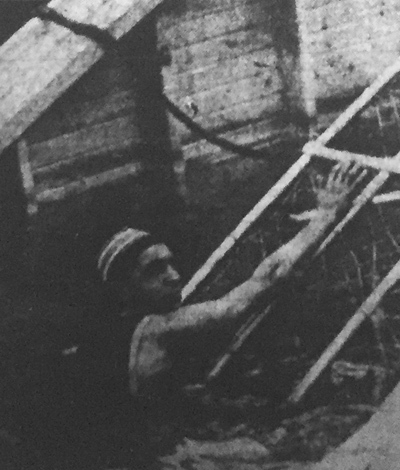 The sort of footage seen in the Pathe reel is the sort of thing you’d think they would have mentioned. But is the Tribune film all that they shot? Sources differ wildly on just how much footage the Tribune got. Most ads and descriptions (including the ones the Tribune made themselves) say that they got about 1000 feet of footage (roughly 15 minutes). But the censorship card says 500. And a few newspaper articles say that they got several thousand feet. So, once again, there’s no known way to connect this new footage to any of the companies known to be on the scene. My hunch is that it’s an “outtake” that was filmed by the Tribune but sold to Pathe instead of being used in their version of the film. followed by a Chaplin lookalike contest. Classy. Now approaching it’s 100th anniversary, the capsizing of the steamship Eastland was the deadliest disaster in Chicago History. Loaded well beyond reasonable capacity with picnickers from Western Electric, the vessel tipped over in the river between Clark and LaSalle, causing the deaths of 844 people, including 22 entire families. 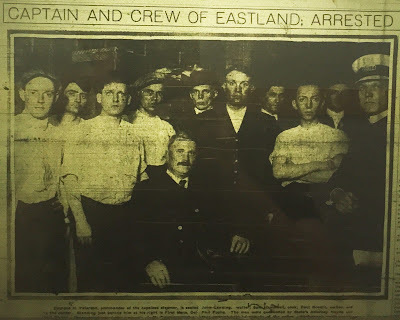 It’s well established that film footage of the Eastland Disaster was made – in fact, some early reports say that witnesses stated that what caused the ship to tip over was a rush of passengers attracted to one side of the ship by the sight of a moving picture camera. 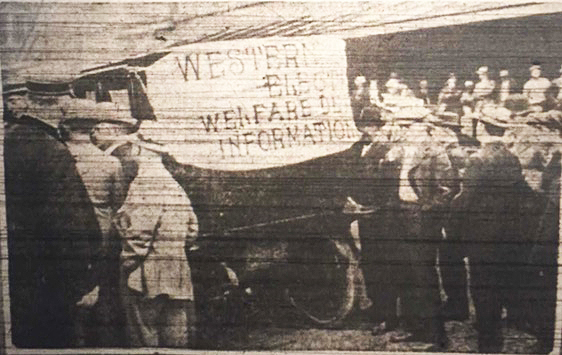 Films of the disaster were being shown in theaters nationwide only days after the fact. Now, at least a portion surfaced in the last few days after it was discovered in a Dutch newsreel posted to Facebook by Jeff Nichols. Film from the disaster itself and the righting of the vessel were uncovered. The first, a 55 second clip from the disaster, can be seen here. The relevant footage starts at 1:10 in the clip. 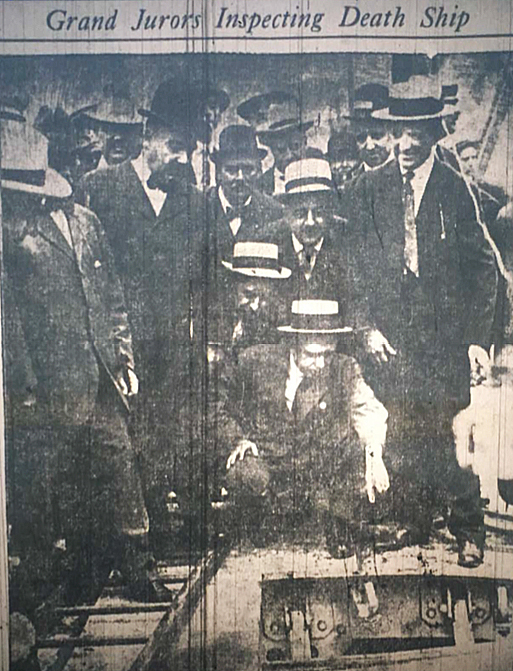 The second, shorter clip shows the righting of the vessel several weeks later, before it was towed to the Halsted Street bridge, where it was docked for some time before being sold. It can be seen here and begins at 9:10. Now, the question is: which footage is this? 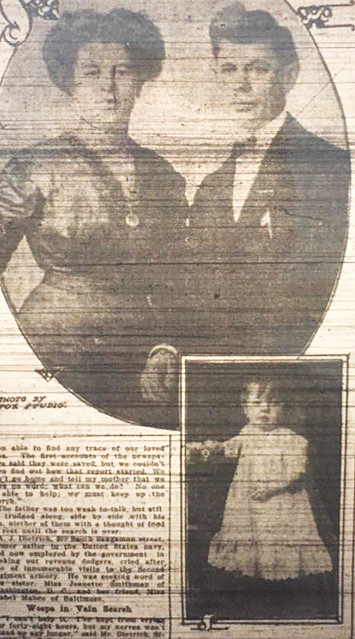 While it’s far from a complete version of the “movies” that were shown in 1915, it’s at least a fragment, and was probably taken from one of them. Several different Eastland films were being distributed in the weeks after the disaster; of these, the most common (and the only ones that I can confirm were film, not slides), were made by the Tribune Company and the Hearst-Selig newsreel camera. The Tribune version became a 1000 foot film that was shown to raise money for survivors; at least 40 prints were circulating at one point. 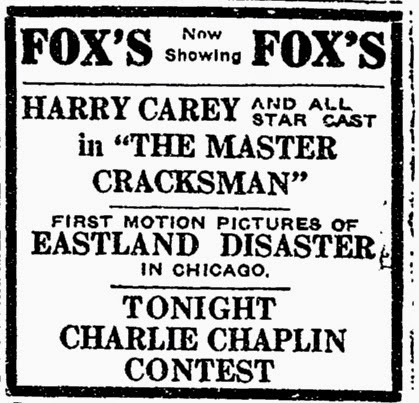 It was banned in Chicago (as were all Eastland films), but could be seen as nearby as Forest Park. 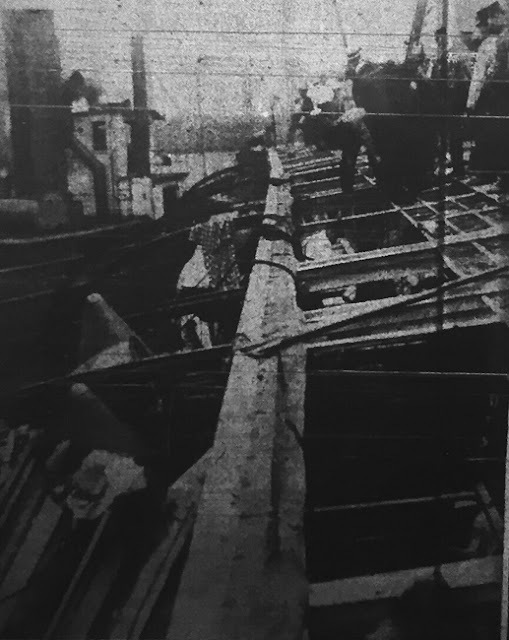 The pictures, taken for the most part from a fire escape on the Reid Murdoch building just across from the wreck, start in with a view of the great hulk lying flat, half out of the water, with policemen, divers and life savers busy over it, saving lives of such as could be reached. 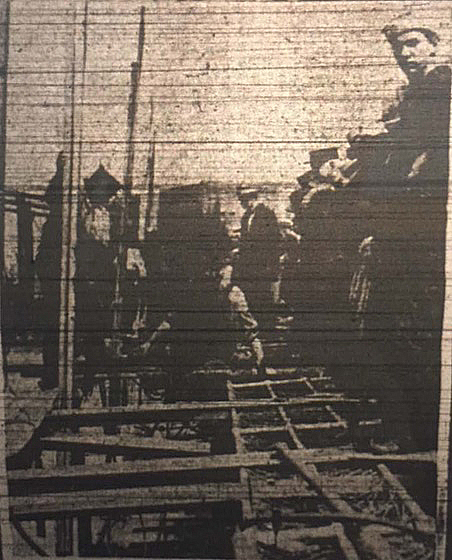 The stretchers are shown with their covered burdens, some borne across The Kenosha’s deck and put into ambulances, some carried over the Clark Street Bridge to the Reid Murdoch building. 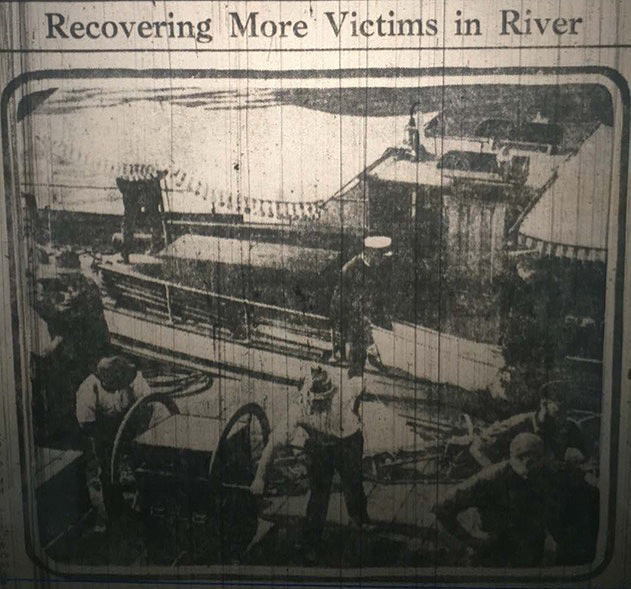 The river full of various craft appears; the crowds massed near by and held back by the policemen; the auto trucks with blankets rushed forward from the great stores to wrap the victims as they were taken from the river. 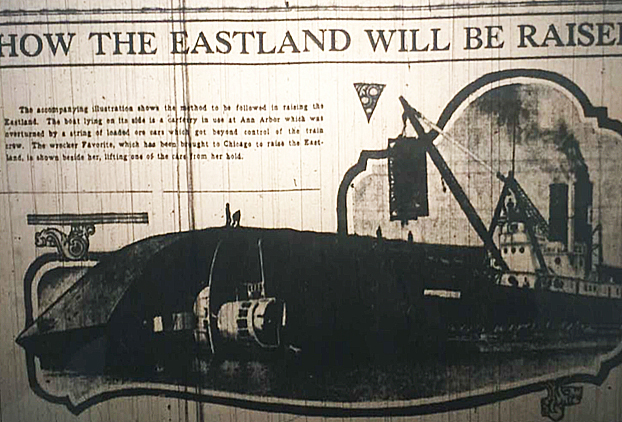 There were repeated scenes of the Eastland itself and of the water about it. Also of the nurses and firemen at work about the Reid-Murdoch building. Finally the pictures showed the Second regiment armory turned into an emergency morgue where many went to seek those who were gone, and with the crowds surging around it. There are no horrors of a repulsive nature. 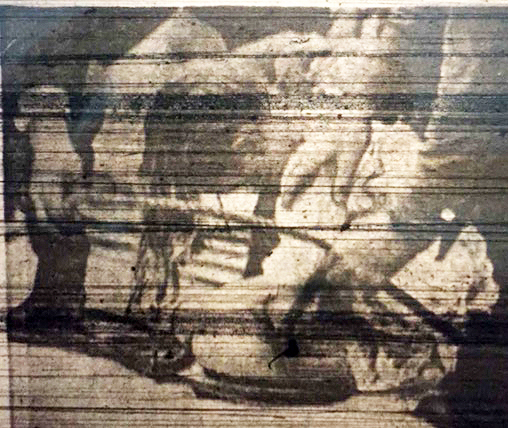 All figures on the stretchers are covered…the distance of the camera prevented any close up effects at all, except of two girl survivors, safe and dry, who posed for the film. 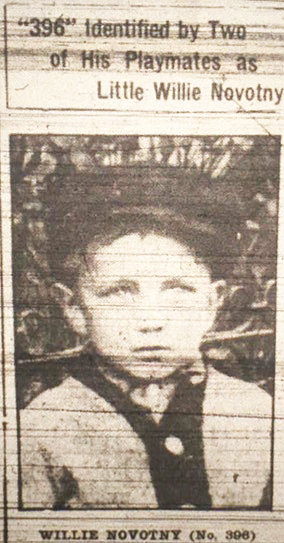 Descriptions of the Selig-Hearst newsreel are a bit more vague. 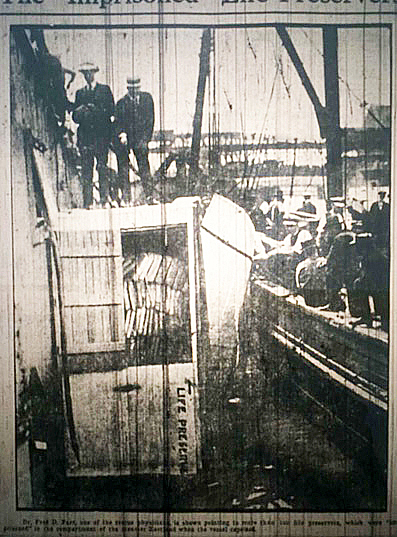 The few descriptions I could find mention shots of the ship, of stretchers being carried, divers doing rescue work, and crowds on the dock. So, based on what we know, the differences are mainly that the Selig version seemed to show more shots of the crowd on the dock, while the Tribune version showed scenes from the armory, not just from the River. Of course, it’s quite possible that the Trib version had crowd scenes as well, and that the Selig could have had an armory scene that just wasn’t mentioned. 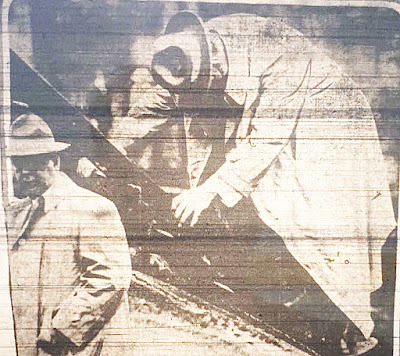 Perhaps the only real scene that would seem like a smoking gun would be the shot of the two girls posing, which would identify any footage as being from the Trib. 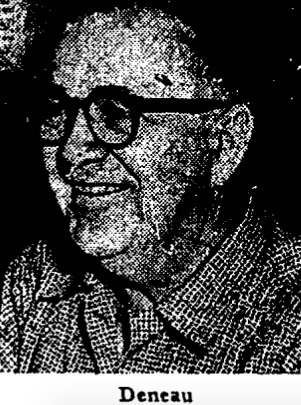 As it is, some of the footage could have been made from the Reid Murdoch, which would be a point in favor of this being the Trib footage. But, really, the first clip could come from either of these films, or from some other source altogether. I’d never heard of there being footage of the ship being righted at all before now. Jeff notes that more footage may be forthcoming. The EyeFilm Institute also has the only known copy of an episode of Selig’s Adventures of Kathlyn serial.